Manufacture of various auxiliary cutting tool, operation accessories using progressive equipment for the modern machining centres, metal working, including control. 2.1 Mould tools and stamps production area. All kinds of stamps are fabricated ot this area: cutting, punching, forging, bending stamps for cold and hot stamping, bending blanks, knifes for guillotines, punches and dies of almost any complexity, mould tool for manufacturing of MRG (from round rings up to the most complicated cuffs). Milling high-speed 5 axial machining centre HEDELIUS RS 80 and high-speed electroerosion machine CHMER 530 which expand possibilities at composite surfaces treatment were put into service in that area. 2.2 Cutting tools and measuring devices production area. Area has following production nomenclature: lathe tools of all types and sizes, twist drills with conical and cylindrical shanks, end reamers, reamer bits, threading tapping dies, machine and manual taps, form tools, special instrument. There is also wide range of control and measuring instrument: arbors for equipment inspection on technological accuracy with tolerances of 0,003-0,001 mm., round smooth calibers, countercalibers, patterns, special measuring devices. 2.3 Operation accessories production area. Equipment area allows to manufacture wide range of operation accessories means such as: devices for gear hobbers, adapters for broaching machines, conductors for drilling machines, accessories for thermal treatment. 2.4 Gear processing: manufacturing of spur gears with module up to 10 and diameter up to 500 mm; skew bevel wheels with module up to 8, action angle up to 30 and diameter up to 250 mm. Hardening of carbon & alloyed steel with temperature of process up to 1050 °С. Tempering, normalisation, age-hardening. Salt-bath hardening of tool steel with process temperature 1200-1300°С. 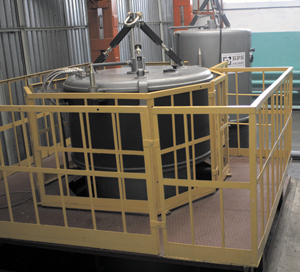 Ion nitriding ION-30М & ION-75I-2 equipment. Vacuum coating on Bulat 1V equipment. 5. Measuring devices repair, including minor, mid-life repair and complete overhaul of measuring devices such as callipers, hole gauges, display heads, surface gauges, micrometers, etc. 7. Manufacturing of general mechanical rubber goods and plastic products from thermoplastic and thermosetting material such as rings, plain cuffs, reinforced lip-type seals, gaskets, dust caps, and also rubberizing of rings pistons.